Nestlé India In Hot Water Over Reports Of Excess Lead In Noodle Soup : The Two-Way Sales of the popular instant soup, sold under the brand Maggi, have plunged since the food safety dispute erupted in India. Nestlé's Maggi instant noodles gained popularity in India as the snack of the middle class in the 1980s. The Swiss giant Nestlé is facing a commercial disaster in India over allegations that its best-selling brand of instant noodle soup contains unsafe amounts of lead as well as the taste enhancer monosodium glutamate (MSG). Sales of the soup, sold under the brand Maggi (pronounced Maggie), have plunged since the food safety dispute erupted. Complaints about the instant soup first surfaced in the state of Uttar Pradesh, where Food and Drug Administration officials reportedly discovered during routine testing that lead content in some Maggi samples was about seven times higher than is permissible. On April 30, they ordered a recall of some 200,000 batches of the noodles. The food scare has prompted a cascade of testing, as one state after the next took up the growing safety concern. Over the past 48 hours, the Delhi government has found that 10 of 13 samples of Maggi noodles contained MSG and amounts of lead over the legal limit of 2.5 parts per million. Delhi is reportedly preparing to take legal action against the company over sales of an unsafe product and "misbranding." It has already banned the sale of Maggi noodles for 15 days and asked the Indian unit of Nestlé to withdraw existing stock. "Excessive intake of lead can cause damage to the kidneys, bones and nervous system. It is particularly harmful to children and can cause learning disorders. Health experts say MSG, often used as a flavor enhancer in processed food and in some restaurants, can damage the nervous system with long-term use." Maggi soup has been slurped by millions of people since it rose to popularity in India as the snack of the middle class in the 1980s. Today, Maggi stalls are a staple on college campuses and rural roadsides. Officials in at least eight other states said they have sent samples for testing at government labs. Odisha, Punjab, Uttrakhand, Assam, Gujarat and Tamil Nadul are among those awaiting test results before they decide whether to remove the instant noodles from store shelves. But officials in the states of Maharashtra and Goa said they have found no negative findings in the samples tested so far. The Times of India quoted the deputy director of Goa's FDA saying that following the nationwide controversy over Maggi, the department conducted a series of tests that found no violation of food laws. Nestlé has said that tests of more than 1,000 batches (representing some 125-million packets) of Maggi 2-Minute Noodles found the snack safe to eat. Nestlé India told The Wall Street Journal on Monday that it tested noodles after food-safety inspectors in one state filed a criminal complaint alleging the product contained dangerously high levels of lead. "Internal and external tests show that lead levels are well within the limits specified by food regulations," the company said in a statement. It added that with the exception of Uttar Pradesh state, "We have til now not received any orders from any state/Centre FDA authorities to recall Maggi noodle products in the market." 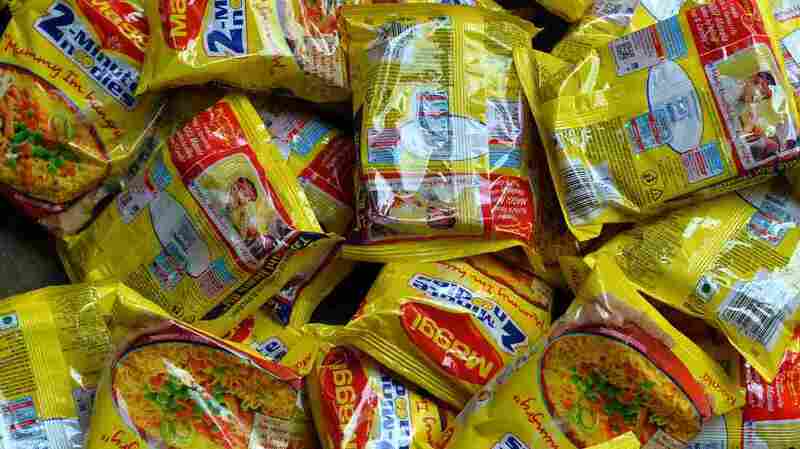 Maggi noodles have been Nestlé's fastest-selling food item in India. The company's stock tumbled about 10 percent today on the Bombay Stock Exchange, its biggest drop in nine years. Author and columnist Chetan Bhagat put it this way on Twitter: "Maggi Noodles is now facing the biggest and fastest PR disaster in the social media age. Cooked in less than 2 minutes this time."